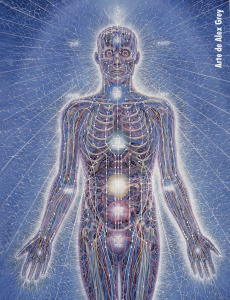 The physical body is integrally connected to and fed by an energetic system consisting of energy pathways (nadis) and metaphysical energy centers (chakras) located along an energy spine (sushumna). In addition, there are metaphysical subtle bodies (fields) of energy surrounding and superseding the physical body in layers (etheric, astral-emotional, mental, causal) that make up the human energy field. 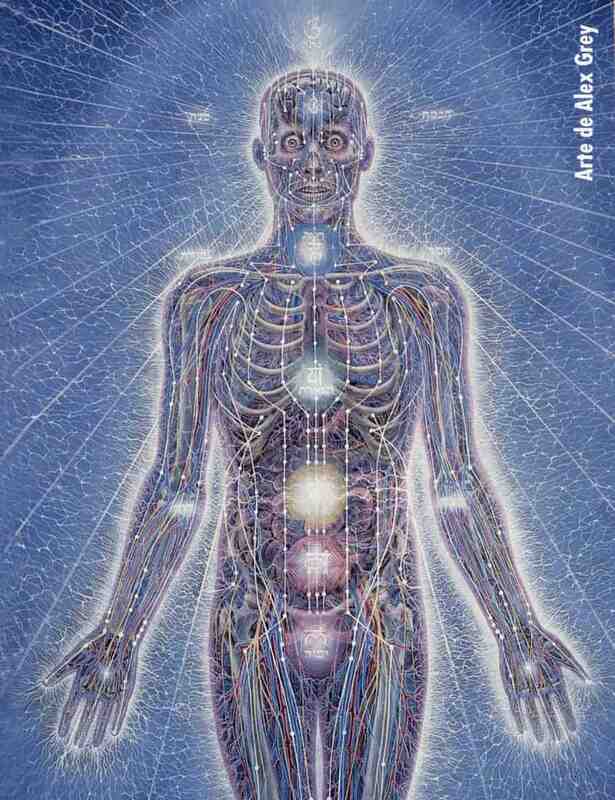 In an optimal functioning man or woman life force energy flows throughout these circuits and fields of energy—vitalizing organs, glands, and nerves. If a blockage, or energy knot, is present due to trauma, severe stress, or emotional overwhelm then there is less life force energy available to nourish the elements of the energy system —and a drop in energy, libido, inspiration, mental concentration can occur. If this condition continues for long, symptoms like apathy, lethargy, sadness and depression can appear and increase over time. Subtle energy fields (or bodies) sense and respond to internal and external stimulus and communicate through the subconscious. Like the physical body tries to reject/eject foreign objects (i.e. a splinter in a finger) subtle energy fields seek to heal or release energetic contractions and blocks wherever there is an imbalance or disharmony detected. Symptoms are whole system responses to stress, imbalances, blockages or contractions, and/or lower life force energy. Restoring health and wellbeing is accomplished by a restoring, balancing, harmonizing, normalizing, or promoting the free flow of energy by removing/releasing the energetic blocks that contract life force energy. Energy healing occurs when there is a restoration of fluency (easeful and effective delivery) of life force energy and a clearing of energetic contractions or knots in the subtle energy fields. 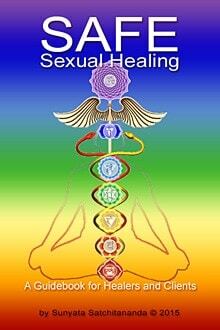 Healing the subtle energy system and fields is essential to overall health and wellbeing. Energetic knots (contractions) come from various sources of trauma, stress, or overwhelm. These can be caused by emotional-physical-sexual abuse, prolonged exposure to stress and severe circumstances, and/or the absence of emotional or physical nurturing. Energy knots behave much the same way that a clenched, or knotted, muscle does when it spasms or cramps up. The cramping energy is restricted from flowing —and subsequently forms a trigger, or hot-button, that has a physical location and emotional activation as well. People who have contractions or blocks to their energy system or fields may feel a variety of symptoms. Frequently, initial symptoms are barely conscious and are subtly felt more than consciously known—until they become more severe and impose their presence on conscious awareness. Symptoms in the body can include areas, or locations, that are stiff, tense, numb, cold, or feel disconnected, dull, discomfort or painful. Additional symptoms include nausea, feeling shut-down or distant, low libido, vaginal dryness, erectile dysfunction, bad memories or nightmarish images, and/or recoiling from touch. Psychological-emotional symptoms include being triggered by “hot-button” trigger issues, irrational fears, over-reactions, depression, lethargy, hopelessness, and despair. I use an integrative method of energy healing and counseling that I call Pranasomatic™ (Prana: spirit, breath, life-force energy; Somatic: body and emotion) which builds upon the work of Wilhelm Reich, Dr. Alexander Lowen, and Jack Lee Rosenberg, Ph.D. by adding expanded awareness of the nexus point where emotional energy meets, and embeds in the physical body –with its physical and energetic knots (or “triggers”) that suppress feeling and life force energy. Pranasomatic™ energy healing and counseling is a whole system approach to health and wellbeing that includes expanding personal energy awareness, developing emotional fluency, deepening self-understanding and awareness, and maintaining healthy body-mind integration. Pranasomatic™ energy healing and counseling is process oriented and includes: intuitive energy reading, personal inquiry and introspection, visualization, guided meditation, breath work, somatic activation and movement, and Reiki energy healing. Sessions vary in experience, being tailored to each individual’s circumstances and condition. Sunyata Satchitananda is an attuned Reiki Shipiden (master) & Quantum Light healer; as well as a certified Tantric Healer.